River City Music has been run and owned by performing musicians for over 25 years. This factor greatly influences the operation of the store. You will note that we close relatively early on the weekends. This is because the majority of our employees and instructors are out on the Portland Music Scene, doing what they love. Most other music stores you come across will try to sell you the most expensive item, perhaps something you really don't need, or even an instrument that you aren't ready for. You will never find that at River City Music. We make every effort to focus on the customer and their personal needs. For us, it is about the love of music, never about the money. You will see that difference the moment you walk through our doors. River City Music offers a wide variety of services including: Music Lessons, Instrument Rentals, Repairs, and a whole store filled with merchandise for any musical project your heart desires. Here at River City Music, you will never walk away with the wrong merchandise, or something that isn't pertinent to your musical endeavors. 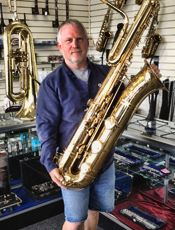 We have employees that specialize in each instrument that we sell, and will aid you in your purchase, and strive to make sure you are pointed in the right direction. It is our mission to make sure that you never walk out of our store feeling like you have been taken for a ride, or that your problem wasn't resolved. This is about you and your musical experience, and that is the River City difference. This is a store built, and run on integrity. We pull out all the stops to make sure you, the customer, get the most bang for your buck and we strive to do so in the most friendly, and helpful way possible. Thank you for visiting our website, and we hope to see you drop by the store sometime. Interested in employment or teaching opportunities? Please visit our Employment Page.